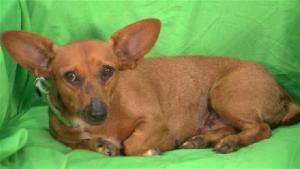 Wiggles is a 3 years old "Dorgi" - a Dachshund and Corgi mixed breed dog looking for her forever home. She a little thing, just about 15 pounds and full of fun. Wiggles loves to play with other dogs, snuggle close to her humans and play with her toys. She's learning her manners and will make a wonderful family companion. Wiggles is housebroken and adorable! Wiggles has all age appropriate vaccinations, is spayed and has been tested for heartworms. Wiggles is a member of the EDNAS Puppies for Parole Program and will not be available for adoption until December 8, 2012. K9 Rescue and Rehab is accepting applications for Wiggles until November 21, 2012. To be considered please visit http://www.K9RescueAndRehab.org and use the ADOPT button to provide the required information. Out of state adoptions are available. Puppies for Parole is a unique program made possible through partnerships with animal shelters and animal advocate groups throughout Missouri. Selected offenders have the opportunity to become trainers to rescue dogs in the program. Offenders work with the dogs teaching them basic obedience skills and properly socializing the animals, making them more adoptable. Once the dogs have successfully completed the program they will be sent back to their original shelter to be placed up for adoption. Last year in Missouri, more than 46,000 homeless canines were euthanized. Puppies for Parole hopes to reduce that number by producing loving, obedient, adoptable dogs. The benefits of this program are three-fold. Puppies for Parole gives offenders the skills necessary to support successful rehabilitation, reentry, ultimately improving public safety. At the same time, this is an opportunity for the offenders to re-pay Missouri communities and repair some of the debts caused by their crimes. Participants have seen this program have a profound effect on the inmates and staff, increasing the safety and security of the facility. EDNAS is the official name of the Missouri Puppies for Parole program in the Potosi Correctional Facility. K9 Rescue and Rehab executes their program in this maximum security environment. The standards are held as high for this program as the security is at this facility. The result of each cycle is to assure all dogs are complete ready for a loving new family home. To help achieve this offenders are provided a training program and the guidance, experience and skills from The Pawsitive K-9, Bob Brasses BS Ag, CPDT-KA Owner and Head Trainer. With each cycle of dogs the offenders continue to learn how to address more difficult K9 behaviors. This allows K9 Rescue and Rehab to continue to assist with the tougher behaviors that end many K9's lives in shelters. Check out all the awesome dogs available for adoption from K9 Rescue and Rehab! OMG! Wiggles is so cute! I sure hope she gets adopted!